Technology was devised to improve human living by providing convenience to the greatest extent. As we can see today, different forms of technology including robotics, Artificial Intelligence, and wearable and flexible technology are existent and within reach for the whole of society to utilize. We were all in awe by the truly extraordinary functions a gadget has been integrated with and not to mention the aesthetics that gives out the high-tech look of the century. Then again, with the human variable that controls technology in general, there are certain tools conceptualized and later materialized that bring the whole idea of technology to its extreme. Literally. This is extreme and over-the-top creepy. I understand how mind-boggling robotic suits are. Who wouldn’t want to be ten times faster and stronger and a whole lot superior than an ordinary human individual? You can do so much with a suit like that of Iron Man such as firing a plasma gun to whoever do you wrong or fly to the skies without the need to buy a plane ticket. Despite the unlimited possibilities technology can offer, there must be a limit to the acts we perform in order to achieve convenience. What this man did is extreme. Tim Cannon, a self-professed biohacker had himself under the knife and implanted a computer inside his body. The computer or specifically the Circadia 1.0 is designed to collect biometric data and pass it on to a mobile device. He’s not just a biohacker anymore; he is also a DIY Cyborg. As of now, the Circadia 1.0 functions as a tool that checks body temperature and relays status messages via a series of LEDs on the device. It is chargeable wirelessly so there wouldn’t be any need for any USB cables to slip into the skin. This is only the beginning but still quite creepy, I say. To the architect of mobile communications, Motorola, this project will either spark up the world into admiration or disapproval. 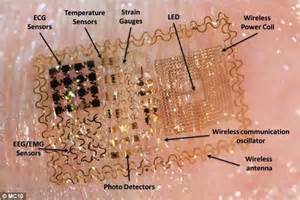 The concept patented by Motorola is a lot similar to a medical sensor back in 2011 that is a paper-thin stick-on circuit that can be affixed directly to human skin. It will look like an electric tattoo without the ink and needles. The tattoo will be incorporated with a microphone, wireless transceiver, power supply, and a power controller. Every signal passed from the tattoo to your smartphone is enabled through NFC and is off most of the time unless it’s turned on by a particular audio stream like a phone call. Because the electric tattoo is NFC-capable, you can’t help but think that it can be used as a human tracker making it easier for whoever or whatever is inclined to track human activities underhand. Just saying.